Almasi, G.T. Blades of Winter . Del Rey 2012. What if: Germany successfully mounted operation Seelöwe in 1941, Hitler was assassinated the following year after he announced plans to attack the Soviet Union, and the Nazi Party subsequently collapsed. 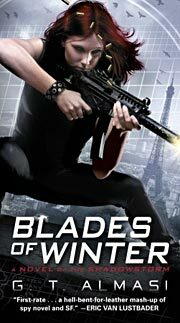 Series note: Series including Blades of Winter and Hammer of Angels . Summary: Adventures of a teen-age cyborg superspy in a 1980 of super-advanced technology and a four-way stand-off between the United States, Greater Germany, the Soviet Union, and China. Series note: First volume of Shadowstorm. Published: Del Rey 2012 (0440423546BUY). Series note: Second volume of Shadowstorm. Published: Del Rey 2014 (0440423562BUY). Publication note: Known as Circle of Zion during development.